The wavelike pattern of this composition’s shoreline reflects Mirei Shigemori’s 1969 design for Tenrai-an, a tea garden in Okayama Prefecture, on the island of Honshu. Tenrai-an was dedicated to Ryujin, god of the sea in Japanese mythology*. The garden’s shoreline and the pond’s bottom are fabricated from reclaimed Corian countertop material. The garden rests in an outer tray of reclaimed cedar planking. 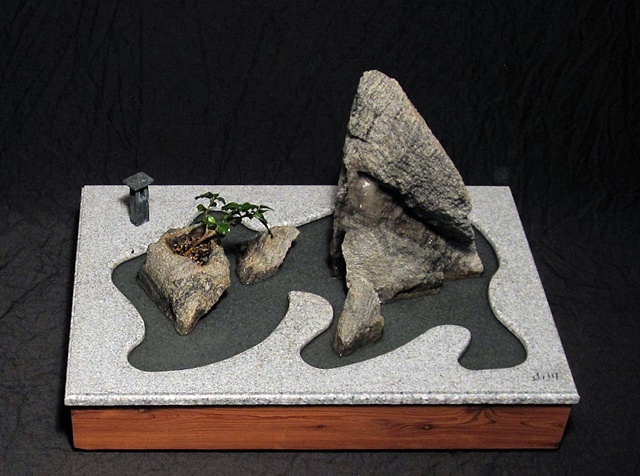 The miniature waterfall adds motion and sound to the composition, further enhanced by cedarwood essential oil added to the rocks.